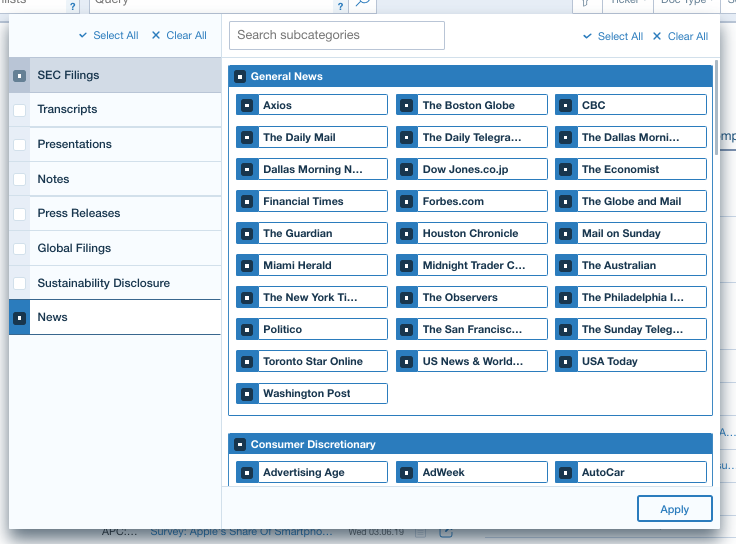 Sentieo’s industry-leading Document Search welcomes a major new addition: over 650 sources from a leading news provider, inclusive of mainstream publications and industry journals going back 2+ years. This new feature will be available to all current clients as a 30-day trial: please contact your account executive or customer success manager for details, or just contact general support. We’ve expanded Sentieo’s existing searchable document database that already includes global corporate filings, transcripts, presentations, broker research, and any internally generated documents or notes that you’ve uploaded, such as private deal documents and thesis write-ups. These news sources are now an integral part of the Document Search function, with the same full set of advanced functionalities that our clients praise. The integration also means that you get a fuller, global news source coverage for the companies you follow, all in one convenient location. Full AI-Driven Search: These news sources are (1) fully indexed and searchable with our full suite of synonyms, proximity, Boolean, and other specifications, as well as our improved Relevance scoring, and (2) they go back two years. Users also have granular control over which sources they want included, just as they already do with different filing types or with broker research. Document Ticker Tagging: The articles are auto-tagged with the tickers you are researching, and they work with your existing Watchlists, saving you hours that you may have previously spent organizing. Integration With Sentieo’s Notebook: just like with any other corporate document, the news and industry journals’ text is highlightable, already tagged with the primary ticker, and ready for your additional tagging/annotation, and sharing. Your highlight will then be fully searchable by ticker and tags, just like a highlight from a filing or a transcript. 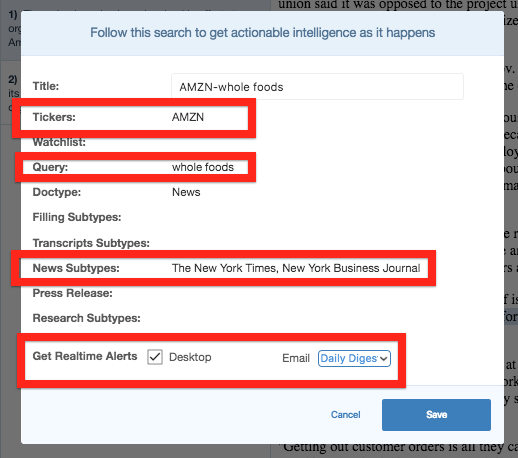 Saved Search Alerts: Sentieo’s saved search alerts already solve a major pain point for knowledge workers by automating and pushing relevant information as it becomes available. Alerts from the newly added sources work just like all other saved search alerts on the platform. You can download the full source list here. Again, please contact your account executive or customer success manager for details, or just contact general support. We’ll be having a webinar on April 10th (sign up here) that will cover everything you need to know about searching through these additional sources in Sentieo. And don’t miss our Table Explorer webinar this Friday!